At the Westfield Santa Anita in Arcadia, the expansive shopping center is hedging its bets on food replacing stores as the reason to visit malls by recently introducing an impressive cornucopia of restaurants and takeaways linked along a whimsically embellished passageway of quirky painted murals and intriguing art pieces that would fit right in at The Broad. This second location of a Little Tokyo staple serves thick, wheat flour noodles that are made from scratch daily and only served to order, giving them the ideal bouncy noodle texture the Japanese simply call “q.” Specify the chasu udon if you love pork belly that’s exquisitely tender in your udon soup, which is an umami-rich, seafood stock (also a vegetarian option). The Japanese curry is classically sweet and savory; supplement it with croquette, karaage, or pork katsu to make it a meal. There’s ramen too, but just look at the name -- udon is king here! The very first thing you need to know is that Uncle Tetsu’s cheesecake is not going to be anything like the dense, creamy New York-style version you probably know and love. They’re probably as dissimilar as Hakata, where Uncle Tetsu originated, is from Manhattan. 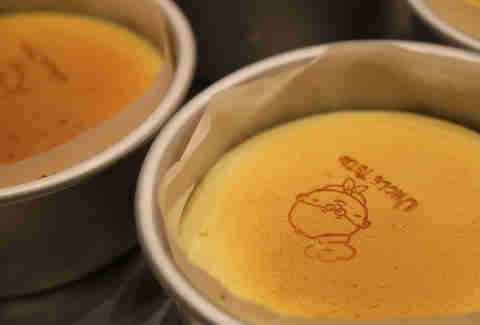 But, just as New York cheesecake is rich, Uncle Tetsu’s is almost a counterpoint cake of airiness, dainty sweetness, and ethereal sponginess. Aside from the slight cheesy taste (made from Australian cheese), it’s more akin to a Chinese paper-wrapped sponge cake. In addition to the regular cheesecake, Uncle Tetsu now offers two new flavors of chocolate and coffee as a limited supply per day. Spongy madeleines and gooey cookies are also crowd-pleasers, and when I say crowd, I’m not kidding. The lines for Uncle Tetsu can be epic -- Howlin’ Ray’s epic, so. This sushi/robata/ramen/poke restaurant is virtually a one stop Japanese food greatest hits spot. 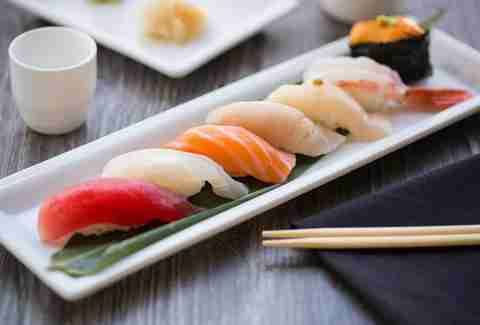 On the sushi side, you’ll indulge in everything from creamy toro sashimi to California rolls filled with snow crab. If you’re set on slurping up strands of ramen, The Backhouse offers a variety of porky tonkotsus to garlicky black miso. But, the real party is with the grilled stuff -- like yakitori with charred bits of soy marinated chicken breast, cartilage, gizzard, skin, heart, and “special hearts” (you only live once -- do it!). Seafood abounds at this beloved KTown import. The raw bar is a highlight at EMC and features all sorts of shucked oyster goodness both sourced locally and further afield. 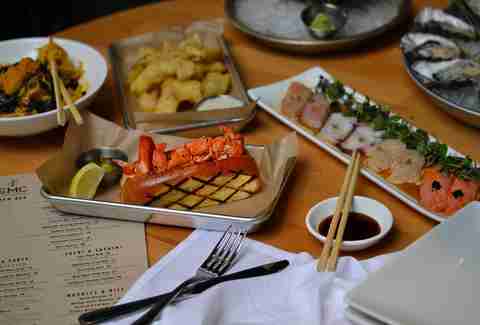 They’ve also got tons of other seafood options, including octopus carpaccio, creamy uni pasta, and a high-roller seafood tower piled skyward with a whole lobster, fresh uni, all types of shellfish and shrimp cocktail. Eugene Santiago is the chef behind this spot’s Cal-bistro-meets-Asian plates with a killer bar program, because, according to Santiago, “The area needed a place for people to enjoy Westside cocktails without having to go all the way to the Westside." The menu includes craft and classic cocktails like the Monkey Mule and Matchito (a boozy matcha drink). However, food is definitely the focus with entrees like the 30-day dry-aged ribeye seasoned by porcini powder and smothered with a yuzu chimichurri, teamed-up with a side of nori fries -- a deal at $32. And, where else are you going to get a steaming bowl of tori paitan ramen and a shepherd’s pie fashioned from braised oxtail at the same place? Matcha Matcha is a small dessert stand that makes big desserts, all from the strong green tea, matcha. Chef Johnny Lee, who also runs the neighboring Side Chick, saw the matcha trend booming in Asia and brought it to the states. Everything you can imagine being matcha-fied is just about offered here: lattes, milk teas, horchatas, soft serves, shaved ice, cookies, and even donuts. The soft serves are totally the Instagram-friendly treats to get; the swirl combo of matcha and black sesame (a seasonal flavor) topped with sweet red beans and Coco Pops is as pretty as it is pretty awesome. Geek note: All the matcha tea powder is ceremonial grade, sourced from Kyoto’s AIYA. Unlike other green teas, it’s a more vibrant hue of green and less bitter -- like the Hulk on a good day. Chef Johnny Lee’s obsession with perfecting Hainan chicken started percolating at Grand Central Market’s Sticky Rice where he was developing a Thai version of the humble, poached chicken dish originating from China’s Hainan province but perfected in Singapore. For many Hainan chicken fans, though, Johnny Lee’s Hainan chicken is as perfect as you can get in the States. His highly methodical cooking of the chicken results in exceptionally tender and smooth meat that’s a pleasure to eat. Apply the various sauces, in particular the oily ginger-scallion sauce, and it’s beyond amazing. The equally popular Hainan chicken rice made with chicken broth is super-savory and should be eaten along with the flavorful fowl. The other chicken choices like the soy-honey glazed, roast chicken and fried chicken wings, singing with garlic and jalapeño heat, are completely different chicken experiences but equally delicious. The highest profile resident of Food Alley is the dumpling master known as Din Tai Fung. As with its other locations, this dumpling kingdom greets you with a showcase window looking into the kitchen where a score of dumpling makers are urgently rolling out nuggets of dough and flattening them into skins that will encase seasoned minced pork and other fillings. 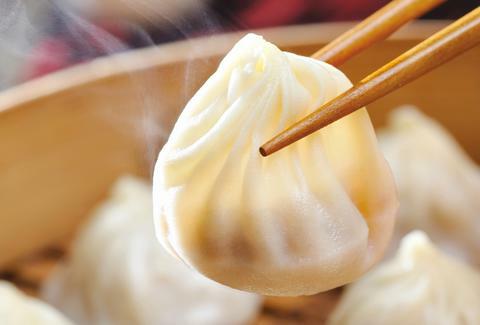 Each of the signature xiao long bao dumplings will be intricately pleated with a minimum of 18 folds by a dumpling artisan who has at least two years of training under his belt. Hold the little dumpling sack up to the light and it’s translucent with pork juiciness. Carefully nibble a corner to breach the skin. Let the soup trickle into your mouth and chomp away. 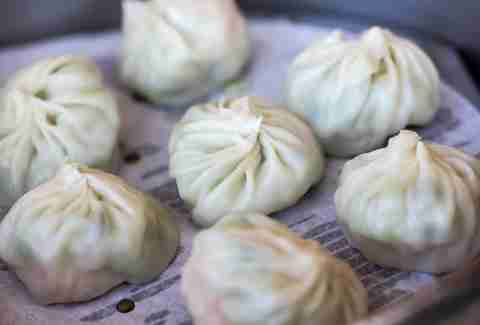 Sure, there are plenty of other great things to eat at Din Tai Fung, many of them are other types of dumplings, but, seriously, the xiao long baos are the reason you made your pilgrimage to the mecca of dumplings. 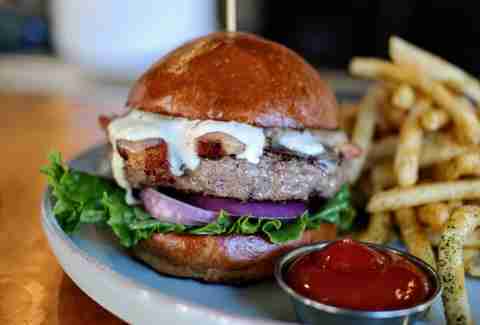 Eddie began publicly documenting his culinary crusades in the form of a food blog called Deep End Dining. He has written for The New York Times, Los Angeles Magazine, LA Weekly, LA Times, VICE, Cosmopolitan, among others. Follow him on Twitter and Instagram.